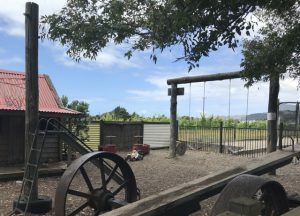 Not all wineries in New Zealand cater well for kids, so it’s lovely to go somewhere where the adults can sit back and sample the wine and/or eat while the kids are happily occupied in a playground. Aimed at younger kids, the playground is fully gated and has a couple of playhouses, swings, a seesaw, and basketball hoop set at a low height. There’s also a separate petanque area that older kids might enjoy. As for the restaurant it’s very relaxed with plenty of outdoor seating including some tables undercover and within sight of the play area. 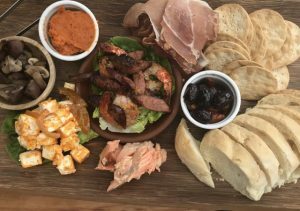 The menu is mostly full restaurant style meals but there’s also a sharing platter that might be an option if you’re not too hungry. There’s a kids’ menu and highchairs. It pays to book, especially in the summer months when tourist buses can arrive. There is of course a full range of Clearview wine to sample as well! If you’re planning to visit the Gannets, this winery makes a great before or after stop as it’s very close to the starting points for both tractor and overland tours. Address: 194 Clifton Road, Te Awanga. It’s approximately 15km from central Havelock North, and around 20km from both Hastings and Napier. Plenty of car parking onsite. Open: for brunch & lunch in the summer months everyday 10am – 5pm. In winter Monday and Thursday 10am – 4pm, Friday, Saturday and Sunday and Public Holidays 10am – 5pm. Closed Christmas Day, Boxing Day, Easter Friday, Anzac Day (25th April), Hawkes Bay Anniversary Day (the 4th Friday in October). Also open some Friday evenings from 5pm for music, food, wine and local beer. Check out the Facebook page for more details of when.